We frequently get calls from whole body vibration plate users who are reporting injuries following the prolonged use (6 weeks+) of their plate. The injuries vary from eye pain to back or knee pain. Some even report stomach upset or headaches. This is unfortunate. Many want to sell us their plate and buy a Juvent. We wish we could afford to buy them and junk them so they wouldn’t hurt any more people. While most paid under a thousand dollars some have paid over $5-7,000! We are continually shocked and dismayed by whole-body vibration vendors who have little or no published research making claims based on Juvent studies. They say they are safe, yet operate at energy levels of 10-50 times higher than Juvent’s micro-impact! They also operate at variable frequency ranges from 5Hz to 200Hz or higher without explaining the danger of organ resonance. Juvent operates at very safe 0.3gs of energy between 32Hz-37Hz, a range known to be very safe. Juvent’s micro-impact is possible because of our patented platform mechanism. It moves your body only 0.05mm in vertical distance. Contrast this to 2mm-10mm in most WBV platforms. 2mm is 40 times more displacement than Juvent! Imagine their claims of safety. No data, no studies just internet testimonials from nameless users. 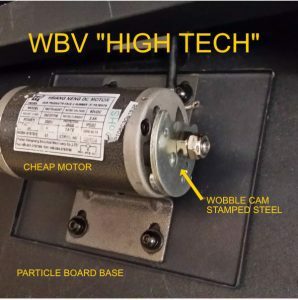 Recently a user referred us to a WBV website where the vendor claimed to heal just about every medical condition I have heard of; not one peer-reviewed study Most of these WBV vendors will not show you their mechanisms because they are usually just cheap motors with an out of round steel weight spinning around. How much does that cost to make? $50-$75? Below is the image of the inside of a Whole Body Vibration Platform. No high tech here.